Can i request a special order? Do you think you could design a bug? I really love your stuff, but I call Boen my bugga bug! If you can't then, i want the monkey, but toy with it and let me know what you think! Thanks, you are talented! He is so Dang cute! I love that you got on that website too. Just be patient with etsy, its super slow. You ahve to add something almost everday in order to sell. 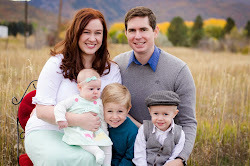 Ksl is good, ebay and advertising with cute baby blogs. There are a few on the side of my family blog that you can email and ask if you can do a giveaway or a special or just have them feature you. I love them.